Butitereventwil.info and its subdomains (ku6b.butitereventwil.info, b8zt.butitereventwil.info, and so on) might start to pop up on your browser from time to time and try to convince you to click Allow button on Show notifications dialog box. Clicking Allow will enable the site to send push notifications to your computer. Notifications are small boxes that show up in the bottom right hand corner of your screen with a message from the site. 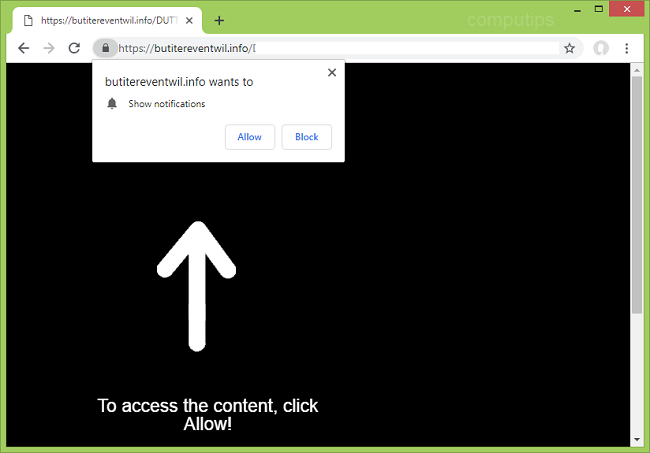 Butitereventwil.info notifications deliver spam, promote shady sites, prompt users to download various software, and so on. Butitereventwil.info site opening on a browser by itself is usually a result of adware getting installed on the computer. Adware might be installed by users (quite a lot of free browser extensions earn revenue by generating ads or pop-ups in browsers) or it can be downloaded along with software cracks, for example. This step-by-step guide describes how you can uninstall the adware and remove Butitereventwil.info pop-ups and notifications from your browser. The easiest method to stop Butitereventwil.info ads is to run an anti-malware program capable of detecting adware in general and Butitereventwil.info in particular. You may try WiperSoft; it’s good at detecting and removing adware and other PUPs (potentially unwanted programs). Note: After removing the adware you might still need to disable Butitereventwil.info notifications manually (see the step named Delete Butitereventwil.info Notifications). You can also try to remove Butitereventwil.info by hand using the following instructions. Go to Programs and Features, uninstall suspicious programs, programs you don’t remember installing, or programs you installed just before Butitereventwil.info appeared on your browser for the first time. When you are not sure if a program is safe, look for the answer on the Internet. Find sites you down’t want to see notifications from (for example, ku6b.butitereventwil.info, b8zt.butitereventwil.info, v9q0.butitereventwil.info, pfw5.butitereventwil.info, etc. ), click on drop-down menu next to each and select Block. Find and tap the browser that displays Butitereventwil.info notifications. Find Butitereventwil.info in the list and disable it. If Butitereventwil.info is opening on new tabs in your browser from time to time, that means you have adware. Most likely one on the apps you installed recently is causing these pop-ups. Uninstall recenly installed and suspicious apps you have. Alternatively, use an antivirus to scan your device for malware.